Your staff — you need to think of them as your colleagues! Don’t think of them as staff because as soon as you think of them as staff, that makes a ‘you’ and ‘them’ sort of theory. In my business customers are everything, however without a happy staff, without happy people, they won’t be looked after and they won’t be treated like they are everything. So treat all your work colleagues like kings. How do you do it? One of the most important things is to say ‘thank you’. Now that’s something you don’t get very often. Try saying ‘thank you’; you don’t have to give them money all the time. Are you thinking like that? Are you thinking “Oh cash bonuses”? No, cash bonuses really don’t do it unless they are one-offs out of the blue. That’s one trick I learned early on. When you give a cash bonus, the next time you give one it has to be more, otherwise it’s “Oh, we always get that, what’s the big deal? But what I found is a hand on a shoulder (please be appropriate if you have to touch at all), adds a little bit more sincerity, or on an arm. Watch what politicians do; remember when they want to take an upper hand, when they shake hands, the clever politicians, something like Bill Clinton used to do; reach out with his other arm and grab it as well to take the upper hand. It just adds that sincerity. Be sure to always say thank you. Now don’t just say ‘thank you’, say ‘thank you’ for some specific task and say it in a way that shows that you actually mean it and you actually know what they did and you can explain to them why you are thanking, why it was above and beyond. Other ways of saying ‘thank you’ is, in a group meeting, to pick out somebody specifically by name to say what a good job they did and then to point out the actual job they did and what made it special, in front of everyone else. Now if you are going to do one after another it doesn’t have the same effect, but if you going to pick them out, don’t embarrass them, just mention it in passing. Another way, tell other people how that person has improved something; that story will get back to them and they will know that their boss, their manager, whoever you are, appreciates them. Next one, speak to them away from their work thing; don’t call them to meet you, go to where they are. Here is another thing, now I’m going to get this wrong because it’s either the boss of L’Oreal or Estee Lauder; I think it was Estee Lauder, I think it’s the husband when he was 80 or something he was being taken through a store by one of his executives, a lady, and her team. She suddenly realized he wasn’t next to he and when she turned around he’d stopped, wandered off to one of the makeup counters and gone over to one of the staff and was talking to her. Just some young member of staff, and when he’d finished he came over and she asked him what he was doing, and who was that he was talking to. He said “I suggest you make it a habit of yours too.” He said it in such a way that said “Or otherwise you will be fired.” Now the lady when she was recounting the story, was then the Chief Executive of the entire company. So I guess she listened to her mentor and learned how to deal with staff. I’m just going to call them staff by the way just for the sake of this. But he treated them well and showed them, no matter who they were, how appreciative he is. That’s another thing, do not instruct your managers to do your thanking for you; if you want to say ‘thank you’ to someone, do it yourself. If you want to say ‘thank you’ to a manager, thank them; teach them how to give gratitude and thanks to the people in their team, but teach them that it will not take money. The other thing you can do is give occasional little once-off prizes. How about a couple of tickets to a restaurant, vouchers to the movies, to a theater? Something like that, once a year, twice a year, and out of the blue, hand it out, have a little competition, give a prize. Just show them your love and appreciation because if you don’t they won’t know, don’t assume anything, they are everything. I would like to think I treat everybody who works for me, whether they are employed by me or they are just contracted by me on a one-off basis; I like to think I treat them all extremely well. And for that reason they treat me well and they treat my customers well, and that’s why on this lovely August day I am 5000 miles away from my company. My company is operating as normal; we have a warehouse, we dispatch goods, we buy stuff, we sell stuff, we employ people, we train people. I don’t have to do any of that because I built up from just me and I trained; I taught all of my staff that they are just equal with me, forget that I’m the boss and if they do a good job they’ll get on fine, and then I say ‘thank you’, that’s what happens. It’s Monday and that means it’s time for a book recommendation. I’m going to go back to our old friend, Seth Godin. 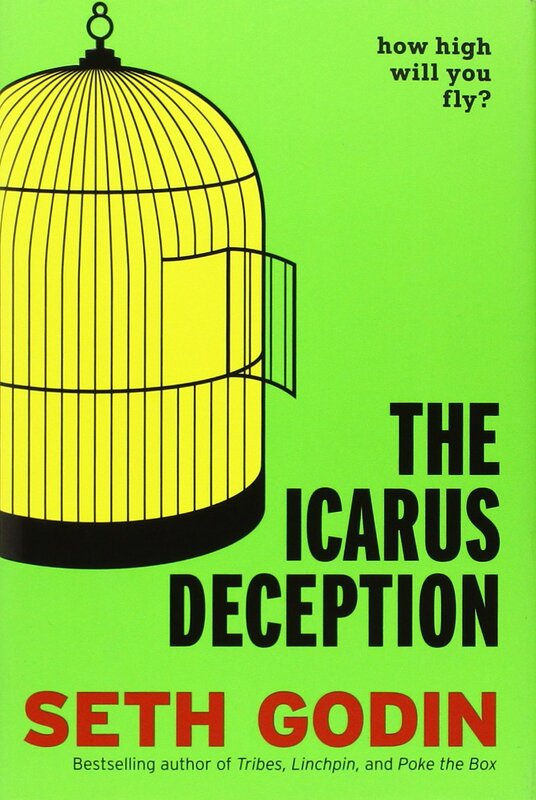 Seth Godin writes brilliant books and today I want you to pick up the book ‘Icarus Deception’. Remember Icarus, the old flying too close to the sun; remember the father said “don’t fly too close to the sun,” but he wanted to get higher, get a bit quick. 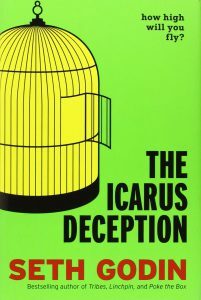 The old wax on the wings melted and fell into the drink, which was the end of Icarus. But what the lesson of that was middle of the road; don’t take risks. That’s not going to get you far. It’s an exceptionally good read and it really does teach good lessons. The good thing with Seth’s books is they are not too deep; they are very easy and they just settle on one subject per book. Well worth reading; he’s written loads other things. Go get it, let me know what you think. I’ll talk to you tomorrow. 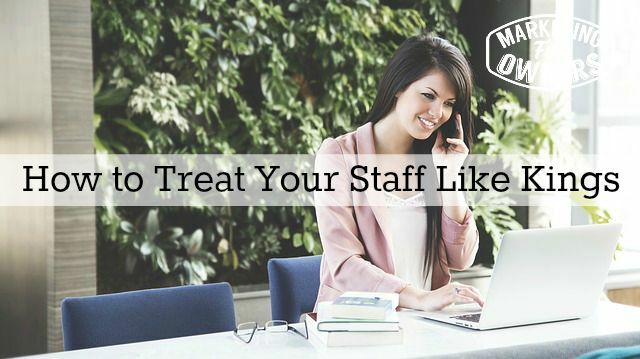 How are you treating your staff?